Motherhood is often exhausting. Single motherhood is nearly always exhausting! 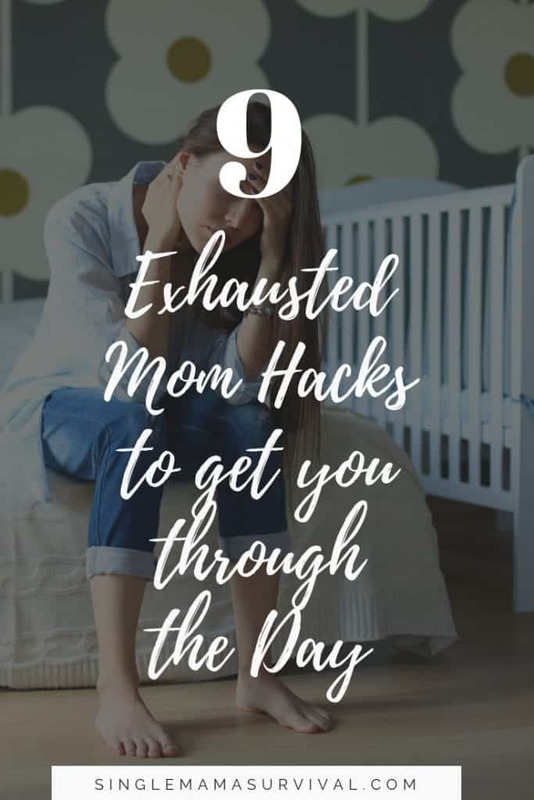 Whether it’s trying to get dinner on the table while simultaneously helping with homework, a teething toddler up all night, running from one extracurricular activity to another, or the million other things that make mothering alone nearly impossible, exhaustion is bound to happen. When you are mom, what can you do? How do you push through those bone tired days when there isn’t anyone to tag team? Today I’m sharing my best tricks from for making it through single motherhood’s most exhausting days. Cut out the unnecessary. Look at your to do list and slash it down only to the most necessary. Everything else can wait until a better day. Hydrate. Drink your water and try not to be tempted with too much caffeination. Make your water a treat by flavoring it with lemon, a cucumber slice, or flavored drops. Get moving. When a nap just isn’t possible, get moving. Turn up the music and dance, take a 10 minute walk, or even do a few jumping jacks. Getting your blood pumping will make you feel more awake. Eat smart. Eat foods that are hight in protein to help you make it through the day. Grab a greek yogurt, peanut butter and apples, or cheese and crackers to get you through the day. Change the scenery. Get out the house and do something fun- even if only for an hour. Have quiet time. Stop the whole house for a rest on the toughest days- mom included. If your kids aren’t nappers, turn on a movie for them while you nap on the couch. If you can get an hour, awesome! But, even 20 minutes to put your feet up and close your eyes can make bedtime not seem so awfully far away. Get help if possible. Hire a local teenager as mothers helper. Or call an equally exhausted friend over for a playdate- then take turns napping while the other watches the kids. Sneak in a small break. Giving yourself a 15 or 20 minutes break can help you recharge enough to make it a few more hours. Do whatever it takes to get that break, even if it means using electronics to keep the kids occupied. A little electronic time traded for a more restful mom is worth it! Go to bed with the kids. When the kids bedtime finally comes, resist the urge to try to do all the things that still need to be done. Don’t do it. Put those littles to bed and crawl right into your own! A new day is coming, the to-do list can wait. What are your go to tricks for your most exhausted days?